Looking for a USED ES-40B-1.5? 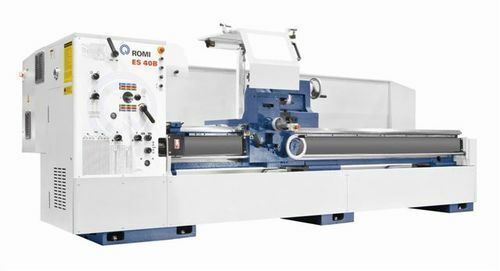 Romi ES-40 Series lathes are robust and versatile with high power and torque. They provide the power and flexibility to machine many part configurations. ROMI is the largest machine tool manufacturer in South America, building a full line of CNC lathes, horizontal lathes and vertical lathes, and CNC vertical machining centers, sold all over the world. ROMI produces all critical components in-house. The ROMI facilities are equipped with the most advanced industrial machinery and equipment - a concentration of machinery and heavy equipment rarely found throughout the world. ROMI’s industrial base consists of 16 plant units, totaling 1.5 million square feet under roof. The company employs approximately 2,000 professionals. Romi Machine Tools, Ltd. is the ROMI Technical Service Center in North America, responsible for sales, service and support for the ROMI machine tools. The Technical Service center is staffed by experienced service and application engineers and maintains on site an extensive inventory of new machinery and spare parts supporting their customers. Looking to Purchase a New ROMI ES-40B-1.5? Charney Machine & Tool, Inc.
S & S Mechanical Services, Inc.
Maquinaria y Suministros ALCE de México, S.A. de C.V.